Fall migrations are under way. In the morning, my son's birding group will meet to count waterfowl, so I'll be up and moving in the dark. Meanwhile, a new species has been seen in Austin. Mrs. Hazelnut, an iridescent green long-legged species of glass bird, has taken up residence. Mrs. Hazelnut joined my flock after a week long flight from Germany, from the studio of the incredible Manuela Wutschke. Back during the annual PISMO Glass Gallery's Bead Invitational, the beads that just dropped my mouth open were Manuela's. I looked at the website photos in absolute awestruck wonder for a few days, and then the opening came and they sold. I was so mortified that somebody had scooped up not one, but two, sets of delicious watercolor beads, without my having the sense to copy the photos for my files. Lucky buyers! 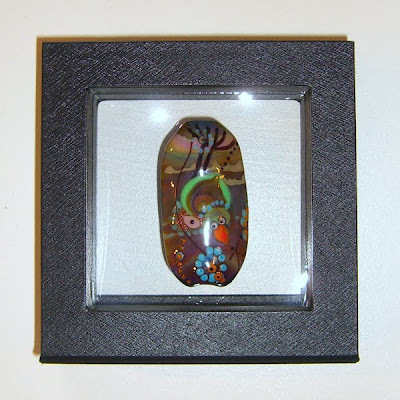 Imagine my delight then, to WIN this bead in Manuela's giveaway on her blog. Day after day, she posts the most incredible birds, fish, lizards, etc. in mouth watering color combinations of many layers of glass. Got a few hours to kill -- go check out her Flickr photos. 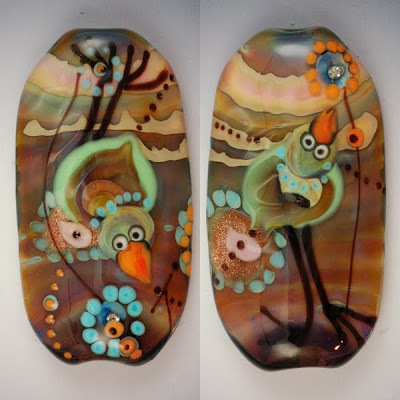 Want one of her birds for your own nest? Manuela has just opened an Etsy shop. 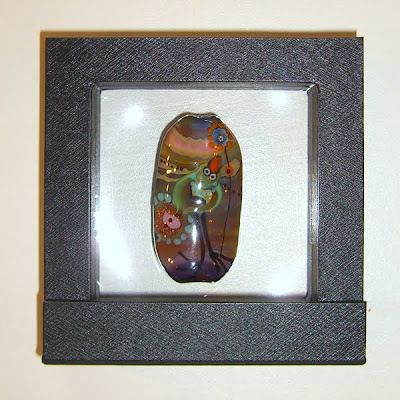 Mrs. Hazelnut earned the honor of being the first of my extensive art glass bead collection to be housed in these cool new display boxes, available from Rio Grande. Called Suspension 3-D Gift Boxes, they suspend a bead or piece of jewelry between two flexible clear sheets of plastic and close with a magnetic clasp. I'm envisioning a whole wall of these to display my collection. This is the smallest 4" x 4" x 1.25" box, perfect for single large beads. There are larger boxes for multiples or bigger jewelry pieces. I think these would add a nice height element to a show display as well. 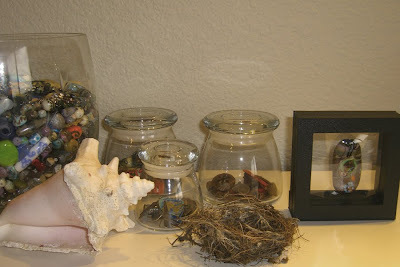 To give you a sense of how they look sitting on a shelf, I tucked the birdie next to my tiny Italian nest, jars of beads and metal clay bits, and the big crystal bowl of bead rejects. I think that Mrs. Hazelnut is for the moment speechless, she never ever dreamed about such a great place to live.... she will be a very happy bird, thanks so much. Doesn't Manuela make the most astonishing beads? You were lucky! Congratulations!